I have two large peach trees in my backyard. They are sturdy;, they have survived wind storms. One tree bends at an angle, like a leaning tower. Yet the tree continues to thrive. 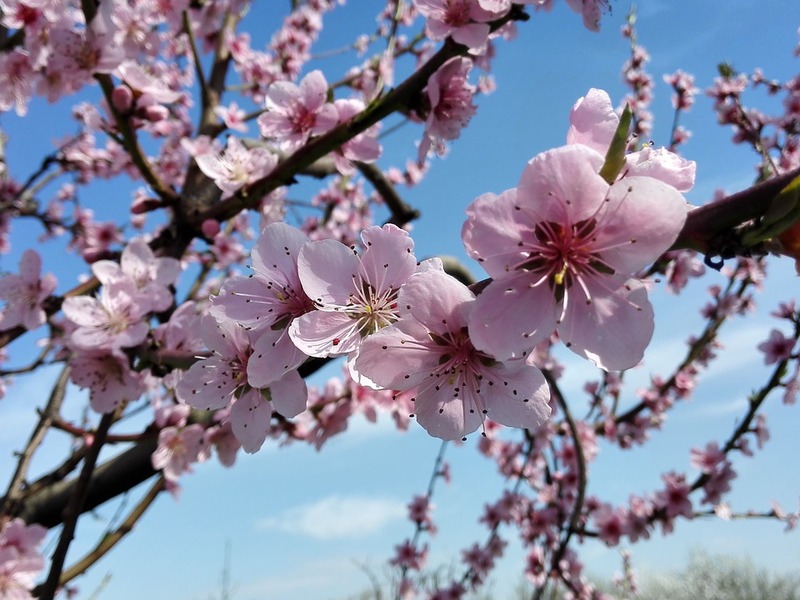 The last few days, I have noticed more and more purple and red peach blossoms sprouting. This makes me smile because Spring is coming. I am also concerned, because, if we get a hard freeze which here in South Texas is still conceivable in February or March, the future crop of peaches from these trees maybe diminished. But right now, I am enjoying seeing the bright colors of the blossoms in the rainy, drizzly weather. Many years ago, when I lived on Okinawa, Japan, late February was always the time of the Cherry Blossom festival. The trees would bring forth beautiful pink blossoms. Okinawan families would sit under the trees on blankets and eat rice balls and drink cups of Sake. You might also hear them play a stringed instrument and sing. This was a peaceful time, and you could not help but also feel safe and content. Currently, the atmosphere is anything but safe and content. We have celebrated Valentine’s Day and remembered those we love. We observed Ash Wednesday and remembered that our earthly lives are finite and unfortunately, we witnessed another tragic mass shooting in Florida, this time affecting high school young people, their teachers and coaches. Once again, the beauty that we see is marked by the ugly evil that is acted out in violence and carnage. I long to see again the Okinawan men playing the Samisen, the Japanese three-stringed instrument, and also to see Japanese women in their kimonos dancing and twirling with their colorful umbrellas. When the cherry blossoms bloomed, there was happiness and joy and well-being. I wonder why we can’t have the same feelings in our country now? I live with road rage, impatient people wanting to pass me on two- lane roads early in the morning, with the bright head beams trying to intimidate me as I drive my car. Again, I remind myself that Lent is a time of reflection, introspection, where thoughts and feelings are shifted like numbers on a spreadsheet to glean what is true and lasting from that which is frivolous. Spring is always associated with promise and with new life. I look for the growing of green grass in my yard, as well as the emergence of new perennial flowers. I look forward in the next few weeks to return the potted plants in my garage back outside to their accustomed places on my property. Still, I wonder when can we learn to resolve conflict and anger in better ways than with lethal force? When will we learn how to take care of people better, especially young people who are experiencing severe mental health problems and who don’t have support systems? When will we adopt means of showing strength gracefully without resorting to using weapons? I wonder and ponder these things as I watch the unfolding of the peach blossoms on my trees. The last days of the Winter for this year will hopefully pass soon. We will require less layers of clothing. We will hopefully see less days of rain and drizzle and fog and more days of sunshine. The journey of Lent always leads to the new life of Easter. What might this year’s journey mean for you? What might it mean for me? I hope the peach blossoms continue to bloom. I hope that I get a lot of peaches !